File contains correspondence related to Freedman's undertaking a rare plant survey along the Mispec River, near Saint John, New Brunswick, for the consultancy firm Jacques Whitford. File also contains four facsimile aerial photographs. File contains the manuscript written by Freedman with G.H.R. Henry and J. Svoboda,. for the Canadian Journal of Botany, volume 64. File also contains the manuscript proof, correspondence, and revisions. File contains the manuscript written by Freedman with B.M. Bergsma and J. Svoboda, for Arctic, volume 37, number 1. File also contains correspondence, photographs and negatives. File contains the draft manuscript report compiled by Freedman and others for the consultancy firm Jacques Whitford Environment Ltd. File also contains a large folding facsimile map and annotated tables of flora from sites on McNabs Island. File contains the draft manuscript compiled by Freedman and others in the Department of Biology, Dalhousie University, prepared for Parks Canada. File contains the manuscript of an article written by Freedman and J.M. Dale for the Proceedings of the Nova Scotia Institute of Science, volume 32. File also includes two hand-drawn charts and correspondence. File contains the manuscript written by Freedman for Nature Canada, Spring 1992. File also contains drafts, correspondence, and colour photographs of the endangered plant. 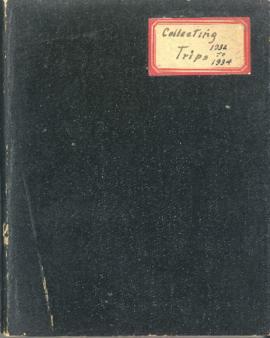 File contains the manuscript written by Freedman with M.L.N. Nams, for Holarctic Ecology, volume 10. FIle also contains correspondence, handwritten notes, reviewer comments, and negatives of figures used in the manuscript. 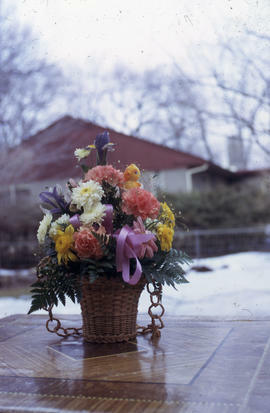 Item is a photographic slide of multicolored flowers in a wicker pot. 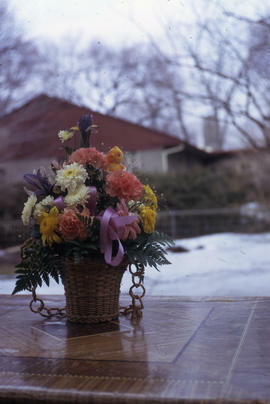 The flowers are depicted outside on a table with snow and a house in the background. They are pink, white, yellow, and purple with a purple ribbon. 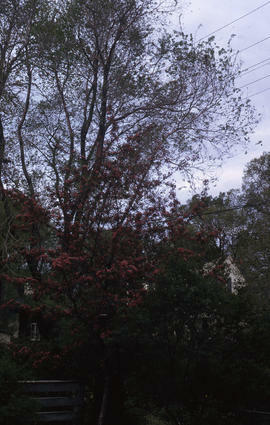 Item is a photographic slide of trees with red and green leaves. The trees become more sparse at the top. File contains 18 photographs taken by Bill Freedman in Hawaii sometime during the 1990s. Photographs show evidence of Metrosideros polymorpha dieback. File contains 58 photographs taken by Bill Freedman at Voisey's Bay, Labrador, in 1996. Photographs show river rapids, aerial surveys of the region, Fraser River Canyon, and some ground vegetation, near the site of the nickel mining operation. File contains 72 photographs taken by Bill Freedman on a trip to Tuktoyaktuk, Northwest Territories, in late 1990. Photographs show ground vegetation and forest scenes. File contains 51 photographs taken by Bill Freedman in the Postville area of Labrador, between 1976 and 1977 (predominantly 1977). Photographs show geological formations, bogs, and flora around the Michelin Lake area near Postville.